The landscape changes quickly at Google and so do the Apps you need. 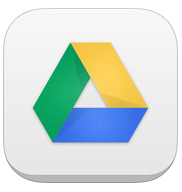 To function effectively with Google Documents on your iPad you will need an extra couple of Apps. One cool feature that has changed is the ability to upload photos directly into your Drive Storage without having to use your precious camera roll. Given that all students have 25 Gig of storage why not use this storage area for all sorts of images. Ask your teachers to photograph the whiteboard if you need to go over work presented in class. They will be able to take a photo and share it with you in a couple of taps. If you create a new document in Drive you will now be taken to the new App below called Docs which is dedicated for document creation. 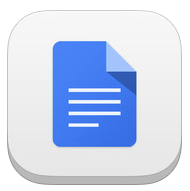 Google is pushing the fact that document creation can be done offline. Once going back online the document is synced with Drive automatically. This Docs App still can't create and edit tables but you can view them. Hopefully Google will have this remedy this soon. 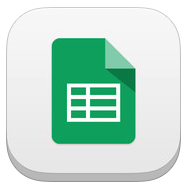 Finally there is a Sheets App which still lacks many features of the Desktop version but worth having if only for working with prepared spreadsheets. A separate Presentation App is coming soon.